Danny and I made the choice awhile ago that when we eat beef, we eat grass-fed beef. There are many reasons for that decision. For one, we truly believe  and the science backs it up  that beef from cows that have been raised on open land, eating grass, is much healthier for those of us who are eating it than grain-fed beef. Why? Well, grass is what cows are meant to eat. Until recently, that’s all cows did eat. The modern meat industry fattens up cows more quickly by feeding them corn. And that can lead to infections and diseases, which require more and more antibiotics. Michael Pollan described the process of this, and its repercussions, better than I can. This decision means that we primarily eat beef at home, or only in restaurants where we know the source of the meat. (I’m the same with chicken and pork now too. And I’ll only eat salmon that’s wild-caught. This means I’m often eating vegetarian in restaurants.) Luckily, Danny knows how to cook beef really well, so there’s no suffering here. Mostly, I can taste the difference. Grass-fed beef tastes richer and far more flavorful than grain-fed beef. Grass-fed beef can be more expensive than traditional grocery-store meat. It’s a sacrifice we make. Most of our money goes toward food (especially now, when we’re developing recipes for our cookbook.) We don’t require or even suggest that other people make this choice. But it’s something that’s important to us. There are a growing number of traditional cattle ranches and farms selling grass-fed beef in this country. We’re lucky enough in western Washington to have the good folks at Skagit River Ranch and Heritage Meat. There might be a good farm near you. 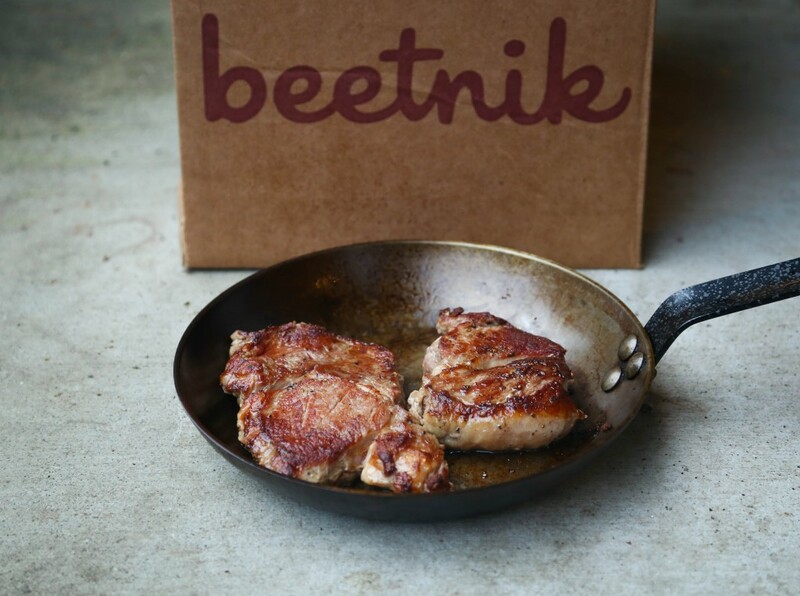 But if you want truly great-tasting grass-fed beef and you want it to arrive at your home directly, you should know about Beetnik, our newest sponsor. We’re crazy about their rib-eyes and sirloins. (These two pieces made some great tacos tonight.) Beetnik grass-fed beef is some of the best beef we have tasted. Beetnik also makes some lovely gluten-free foods, including pancake mixes, tarts, cheesecakes, pasta dishes, and sauces. You might love those too. We like to let our sponsors introduce themselves. Welcome to Beetnik, our latest sponsor! Why does Beetnik focus on selling grass-fed beef? Can you tell us about the source of the meat? Why does Beetnik emphasize gluten-free foods? Can you share some stories of customers happy with your foods? I ordered the Paleo tasting menu. My order was shipped promptly and received easily. Most of all, the food is amazing! The grass fed beef is delicious. The burger patties are no ordinary hamburgers and the bacon wrapped filet mignon was easy to prepare and just melts in your mouth. I could rave on, and have to friends. I am recovering from cancer treatment, and being able to order food that is not only easy to prepare, but also incredibly healthy has been incredible. Thanks Beetnik! ‘My husband was put on a gluten-free diet by his doctor more than a year ago. It was a really hard transition for both of us. Not only was giving up regular bread and most desserts hard for him, his understanding of foods is such that he doesn’t realize that wheat goes into a lot of things (like popovers and wraps and so forth). All to say, he wasn’t at all happy about eating gluten-free, and I was having a real hard time preparing meals that were gluten-free and that he found tasty. My husband absolutely LOVES the food. And that’s no small victory because he was getting so picky about the food I was preparing for him and hardly ever finishing what was on his plate that he had been losing weight precipitously, to the point where at his last doctor’s appointment, the doctor said he was malnourished. My husband has both a very serious form of Lyme disease as well as multiple sclerosis, so he’s got to be eating, and he’s got to eat healthy. Your Beetnik foods have become a vital and major component in achieving that. And also, when he’s able to eat foods that he enjoys eating, it makes him feel less deprived, which makes it easier for him to deal with the other health challenges he has to deal with, and THAT makes things a little bit easier for me. Beetnik is giving away grass-fed sirloin steaks to two readers of Gluten-Free Girl and the Chef. If you would like a chance to win, please leave a comment about why you are interested in the steaks. Winners will be chosen at random on Friday, December 20th. Update: the winners have been chosen and informed. Thank you for your interest. Even if you don’t win, Beetnik is offering a discount for all readers of Gluten-Free Girl and the Chef. When you shop on their site, simply use the code gfgirl. Grass fed is definitely the way to go. So happy to learn about this company! I love food, too! Especially healthy, food, including humanely raised, appropriately fed, humanely slaughtered meats. Generous give-away, I’m off to check out their shop. Thanks. A great approach to eating responsibly. I would love to try their food! I’ve been gluten free for about a year and a half and always looking for new, tasty, real food to try! I am new to the gluten free diet, and I am always looking for food sources that I can trust. Thank youI’m very interested in grass-fed and gluten-free food and had not heard about this company. Grass fed and grass finished is the only way to go. It is pricier so but we don’t eat that much beef so it’s a splurge once in a while. Way to go new sponsor! Thanks to you and Beetnik for this great giveaway! Good steaks are always interesting! And eating good steaks is even better!! I am more and more commited to grass fed beef. I love the rich taste! I have an opportunity to transfer with my work to island life. For health, I am gluten free and corn free. With island life, good mail sources will be valuable. I have never had grass fed beef. Would LOVE to try it. We only eat grass fed beef in our home! I would love to win some! Thank you!!! Eating gluten free is a requirement in my home due to celiac disease. Grass-fed beef tastes SO MUCH better also…excited to hear about your company! interested as grass fed beef tastes the best and full of flavor!! Raising 4 growing boys, I feel very compelled to be conscious of what I feed them. GrassFed Beef is the way to do it! I’ve just started experimenting with grass fed beef. Although we only eat beef a few times a month, I want it to be really delicious when we have it. It’s definitely different cooking than traditional beef, but I’m excited to try more cuts than just the standard that we can get locally. I would love to try this beef. We live in Alaska where wild-caught seafod is readily available but not grass-fed beef. We had it recently in Ireland and would like to have it again. You can order from Blue Valley Meats – they ship to Alaska – no delivery charge. http://www.bluevalleymeats.com/ I’ve been getting meat from them for years and it’s delicious. I’m a cattleman’s daughter and grew up with home raised beef. Would love to try these steaks. More and more I’ve been trying to purchase grass fed meats and wild fish. I’ve really only been buying ground beef for some reason and it would be fun to check out another cut of meat. I always like trying out new companies as well. I’d agree with everything you’ve written, and I’m glad to know about your latest sponsor. There seem to be more and more mail order sources for grass fed meats, which is cool. I would say it’s even more important to source poultry and pork and dairy from small purveyors, however, as the abuses of the animals in those industries are far, far greater than those experienced by feed lot beef, who at least are fed their natural diets for a few short months. Since September we have been eating more vegetarian meals, as well as only organic or local meats. Would live to try Beetnik! I am also GF. I only buy grass fed beef but there are some farms that have better tasting beef than others so I would love to win some to see how these taste. I believe in the health benefits of grass fed meat and appreciate the humane treatment of the cattle. I would love to try these steaks. We too only use truly free range chicken and grass fed beef (and wild caught salmon), so winning these steaks would be a nice treat. The meat here is very expensive when buying from a farm or good quality source, so we often don’t have meat as the main course! Just a little free range chicken in a gluten free pasta casserole is more likely. Thank you both so much for offering this! We are a celiac family and I am strict paleo. We only eat grass fed and grass finished, free range and wild caught. We know it’s the only way to go. It’s so nice to find a new place to find these products. We would definitely love to try them out. Grass fed is the way to go! Looking forward to the day when it’s less expensive. You know, like how flat screen TVs are cheaper nowadays. I wish my food budget allowed for grass fed beef always. I barter fresh eggs for grass fed ground beef. But I’ve never had enough eggs to splurge on steaks. Sounds like a real treat! My husband and 3 of our 5 children are gluten intolerant. I cannot tell you how much we appreciate your help in finding delicious and local resources in the Seattle area! We would love to try this grass fed beef and will have to try the local farms you mentioned too. Thanks! I Have Only Tried The FIlet So Far And Love That….Would Love To Win The sirloin!! It’s so exciting to see these companies emerging! Would love to try some of this beef! Once I had my daughter, I became serious about the quality of food I put in her (now my) body. I would love to experience grass fed beef with her. Thanks for all the hard work you do to provide quality food. These steaks sound amazing on a number of levels: animal welfare, environmental welfware and human welfare. This beef sounds great! I only eat grass-fed but had not heard of Beetnik before, so I’m going to check them out! So lovely to know of mail order source for grass-fed beef. We don’t eat beef often (once a month or so) but grass-fed is so much more tasty. I am a gluten-free, mostly pescaterian eater, but am carefully starting to eat a bit of grass-fed beef. Would enjoy trying a medium rare steak! Eating meat for me is food-gasmic! I am a lover of deliciously cooked meat & knowing that the meat I am eating is sourced from a place of great care & concern for the customer; that just intensifies the experience even more. It is such a pleasure and luxury to be able to enjoy meals that not only fufill hunger but norish the soul as well. I would be honered to slice and devoure that beef! I’d love to win the steaks because I love steak. I’ve purchased grass-fed meat at our local farmers market but they’re only open on Saturdays for a short time a few times a year. Will definitely check out the website. Thanks! Thank you for highlighting the importance of sourcing high quality meats! I only eat grass fed/pastured meat these days and I feel pretty darn good about that. Would love to try Beetnik some day. I have heard the benefits of grass fed beef and I would love to try some. The new company sounds great. Would love to try their meat! Maybe I’ll get lucky. Grass fed meat is far superior to grocery store meat. I grew up in the Midwest and agree, grass-fed just tastes better! I’m glad there are companies out there making it possible for anyone to get good tasting/better for you beef. Wow- what a great give-away! My GF hubby & I only eat pastured meats, for all the same reasons Shauna’s family does. We almost never can afford steaks, though, so we’d really enjoy the treat. Thanks for the giveaway! I am just this week switching over to grass-fed meat and dairy, as well as pasture raised eggs. So excited to discover Beetnik, as I am also gluten-free. If I win, a friend will be cooking it in his kitchen for my son and husband–our house is vegetarian! I’ve been vegetarian for too long to consider even this meat, but if my family members will be eating it, I want them eating meat that comes from a place of respect for the animal and the consumer. It’s great to go the responsible way with grass fed beef. Living in Central Texas, I am happy to learn that the cattle farm where Beetnik sources their beef is in Bastrop, just down the road from me! I would love to try some of their beef! Grass fed makes sense to me but it’s not often an affordable option. I’d love to taste what I’ve been missing and to share with my boyfriend who isn’t yet convinced that it makes a difference. It will be fun to make a believer out of him and feel good about what I’m feeding both of us. Thank you! When grass-fed beef became available at our local farmer’s marked I began eating it again. My first was simple ground beef made into patties. I was amazed to taste beef that reminded me of childhood! I’m of the generation that heard the first commercials for “corn-feed beef” and the public was made to believe this was a good thing. I’m glad it’s more widely available now. Have been reading more and more about grass fed beef. Certainly wanting to check it out. I have just been diagnosed with a hormone imbalance and my son has eczema and food allergies. So I have been reading on paleo and grass fed beef. I think this could also benefit my husband and daughter who have seasonal allergies. I would really like to give it a try. Thanks for a great post and giveaway! Unfortunately, where we live there is very little grass-feed beef available at a reasonable price. It would be nice to try this . A steak like this would sure help me get over my iron deficiency…! I can get grassfed beef locally (Michigan), but don’t have it often due to the price. It feel so much better to eat truly natural meat. Would love the chance to try those steaks.